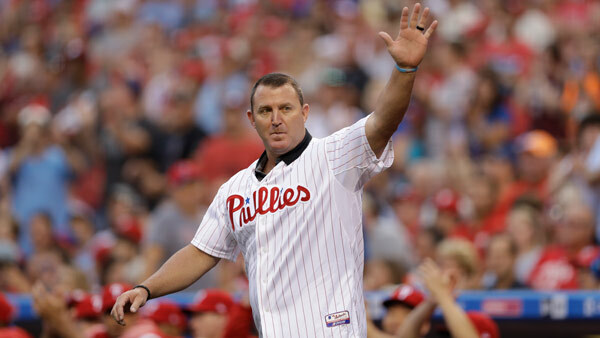 The Philadelphia Phillies will honor 2018 National Baseball Hall of Fame inductee Jim Thome in a pre-game ceremony. It will take place before Thursday, June 14th 1:05 p.m. game against the Colorado Rockies. Thome spent parts of four seasons - 2003-05, 2012 - with the Phillies. He batted .260 with 101 home runs, 281 RBI and a .925 OPS. He was inducted into the Phillies Wall of Fame in 2016. The ceremony will take place on the 14th anniversary of Thome's milestone 400th career home run. He remains the only player in major league history to hit his 300th (Cleveland Indians), 400th (Phillies), 500th (Chicago White Sox) and 600th (Minnesota Twins) home runs with different teams. "Jim's signing ushered in a new era of Phillies baseball," said Executive Vice President David Buck. "He had an immediate connection with our fanbase and gave our franchise a renewed level of respectability. Jim's election to the Hall of Fame was always a matter of 'when' not 'if' and we are excited to be able to honor him for that historic achievement." Thome's wife, Andrea, and their two children - Lila and Landon - will also be on hand for the celebration. Lila will be performing the National Anthem.